Culture is a top buzzword these days. Likely with good intention, since it is culture that enables groups of talented but different people to come together in a way that allows a project to be completed, a team to grow and success to be sustained. Therefore, creating an innovation culture for your organization can be the key difference between an organization that innovates and grows and one that does not. Let’s begin by establishing a working definition of innovation. For our intents, we will define innovation as the action of creating or improving a process, product, service, or solution. This definition allows us to see that innovation isn’t about the light-bulb moment. Innovation is something much simpler; it’s the consistent improvement of things that we are already doing. Take as an example something that felt most revolutionary when it first appeared as a consumer product, the iPhone. The iPhone was unlike any phone we had seen before. It wasn’t just a phone at all, but a computer that would fit into our pocket. This most certainly fits the definition of an innovation. The innovative beauty of the iPhone wasn’t in how it revolutionized things, but in how it pulled all of these things together in one simple form. You see, when the iPhone was introduced cellphones were common, and the iPod had been around for years. We were also used to digital photography, and using the mobile web was something Blackberry users knew well. The true innovation came from the simple process of understanding that the technology existed to bring all of those things together in one product, a product that would be easy enough to use that people would be happy, even ecstatic, to own. That kind of innovation, we all have access to. However, because those kinds of connections don’t occur in every organization, they must be embraced and nurtured. That’s why culture is so important to the innovation process. Much as we defined innovation in a way that allows us to view innovation as a process, what does culture mean in the context of innovation? Let’s define culture as a set of shared values and goals that encourages collaboration and freedom of thought and experimentation. Let’s dissect this quickly to highlight the important parts of culture from our point of view. Over the past few years, we have seen many “best” workplaces boast about culture in their press material that focuses on fun and games, but which have little connection to achievement. It is important that your culture focus on achievement because the best teams and the best innovations occur out of intense focus on goals and outcomes. To me, this is essential in innovation because I think one of the things that helps encourage the best innovation is those random observations and connections that come from diverse viewpoints. By focusing on collaboration, this should lead to more opportunities for those types of interactions and connections. Collaboration should happen in a variety of venues: over lunch, through email or even with collaboration software. Just as with the point above about lots of innovation happening in the space created by collaboration between people with different view points, having the freedom to think outside of the box and to experiment with things that might not work can lead to successful innovation and new ideas. So how do we create a culture that fosters innovation? In my research and work, I’ve found that the organizations that do the best job of creating a culture of positive innovation do several things that encourage it. I’ve outlined a few below. This is a call for leadership to focus on what you want to have occur, not on just what works presently. Over the last two years, Booking Protect, a United Kingdom-based insurance company, has reinvented the way that they deliver customer service. They did this by building a proprietary digital service platform, changing their refund policies to reflect service and speed, but most importantly, by creating an environment where each customer service agent took personal responsibility for their customer. What Simon shares is simply a process of rewarding the activity that you want to see happen. If you want innovation to be a part of your organization, you must reward that activity. That might mean rewarding the best idea that doesn’t work. It might be rewarding the most ideas. It could be anything, but you want to tailor your reward system towards one of innovation. Innovations don’t always happen right away. Many organizations get jammed up when they start a new initiative because they expect that it’s going to change everything the first day. In most cases, innovations that appear sudden are actually the result of an accumulation of thinking, doing, and connecting over several weeks and months. Looking back at the iPhone, it came along at a point where the technology to put a computer with an mp3 player and digital camera in your pocket all came together. While these technologies were all available separately for a long time, pulling them together took time. So will innovation. I was reading a book about the birth and growth of Pixar films and the culture of innovation that they created around telling stories, and one of the first things that stood out to me was that they had a culture that gave the stories time to become clear. What I mean by this is that in many cases innovation is a process of iterations. Which means that the first iteration or idea isn’t likely to be fully hatched or formed, just like with a story from Pixar. Unfortunately, our tendency is to judge everything immediately. In a culture that rewards “hot takes,” it is important to remember that the first take isn’t always the best take. Remember that ideas take time to solidify, and the same goes for innovation. As I mentioned earlier, a lot of what we view as innovation happens in a space created by people coming together and sharing their different points of view in a way that adds a new perspective. In creating a culture of innovation, it is important that both sides of every conversation be considered. This means that the organization and the leadership must encourage input from everyone. When I was first starting out and working at the Experience Music Project in Seattle, one of the identified challenges was that management was too far removed from the day-to-day operations of the museum. So, when making decisions, it made sense to hear from people that were involved in the day-to-day operations of the building. This led to meetings and committees of people that were tasked with coming up with ideas to help improve the experience of guests. While having a committee empowered teamwork, the real key was making sure that everyone offered feedback at each meeting. For some people this was easy because they were inclined to contribute. For others, if they didn’t feel comfortable contributing, there were processes and leaders in place that made sure to call on the people not speaking up. In too many cases, we listen only as a placeholder for the next opportunity to talk. Practicing active listening is simple. All that is required is that you concentrate on what is being said, understand the message, and respond accordingly. This practice alone can drive your organization’s innovation forward because the process of active listening often encourages more deeply thought out responses and ideas. 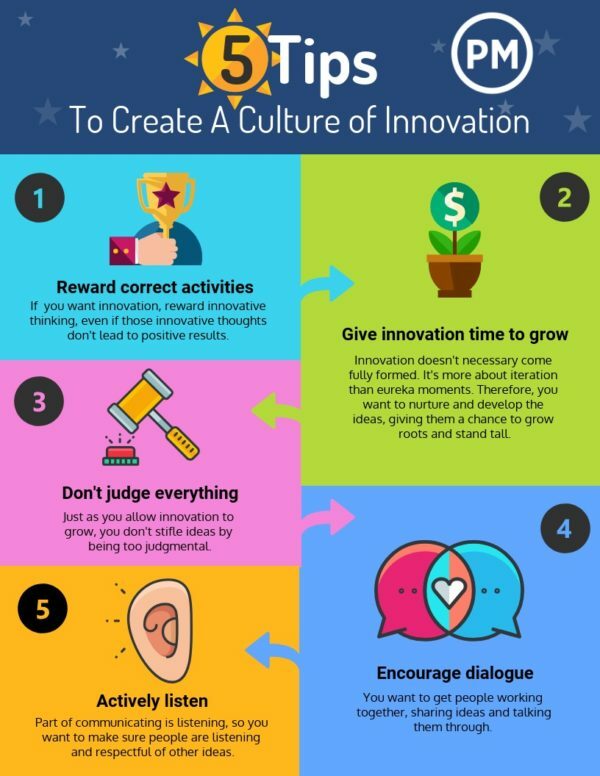 By combining these five points of emphasis you can make certain that a culture of innovation isn’t something that you hope for, but something you achieve. An innovation culture needs the practical application of the right tools to get those ideas from concept to execution. ProjectManager.com is an online project management software that is as innovative as you are. With its online Gantt charts for easy scheduling and real-time dashboard to monitor and report on project progress, dreams do come true. Try it today with this free 30-day trial.